Yes, the pun is intended. There seems to be an undeniably close relationship between the two words ‘pane’ and ‘pain.’ Let’s face it, cleaning windows is a chore. Yet there are few things more immediately transforming to the appearance of a home than clean windows, inside and out. And no better time than now to get the job done. 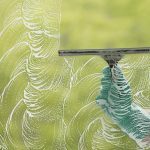 Summer is the time of year when the sun is shining it’s brightest, highlighting every little smudge, streak and finger print on our windows — making it also a time of year when many homeowners think about cleaning them. So how can this daunting task be made a little easier if not enjoyable? We start by using a readily available — and safe — solution. For example, a mixture of vinegar and water (half vinegar and half water) makes a great solvent for removing dirt, hard water spots and most types of what we’ll call ‘light grime’. White distilled vinegar is not only an effective cleanser, but also a smart way to avoid using harsh chemicals. Plus it’s environmentally friendly, readily available and inexpensive. Other items you’ll need include: 1) a soft sponge, preferably natural or undyed, 2) a squeegee (especially handy for large windows and sliders) and 3) a newspaper. Although the cleaning properties of a newspaper remain something of a mystery, nothing seems to work better at getting windows crystal clean and clear. To wash the window, soak your sponge in the vinegar/water solution (or use an old spray bottle to apply the solution directly onto the glass) and gently wipe to lift the dirt. Avoid scrubbing which can cause scratches. Then dry the window using your squeegee. Start in the top left corner of the window and use sweeping horizontal strokes, creating a reverse ‘S’ pattern. Wipe the blade of the squeegee with a crumpled piece of newspaper (or lint free cloth) after each pass to prevent drips. Always squeegee from the top down. Finally, wipe any remaining solution from edges and finish by polishing the window to a dazzling shine using your crumpled newspaper. Besides the amazing sparkle, paper leaves a film that is resistant to dirt. 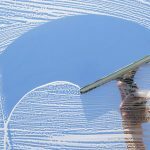 Tip: Wash windows on a cloudy day because direct sunlight will dry your cleaning solution before you can properly squeegee and polish the glass. So now that you’ve gotten your windows looking their polished best, what about those drapes and blinds? Click here to schedule an appointment for professional cleaning. When it comes to window treatments, you’ll want to leave them in the hands of trusted experts.